and most are now professionally designed by corn maze artists. hour before the actual closing time. Open: Late September and runs until last October. Open Columbus Day, 10am-6pm. No pets. Closes in rain. Open: Early September to the 1st of November. Call for hours. $2; Children under 2 are free. Group rates available. cow train ($1 per person), night maze, picnic tables. popcorn, drinks, and farm-grown produce for sale. Open: Please call for opening date. Three corn mazes to choose from. Open: Summer, From 11:00 a.m. until dusk through Halloween. School and organization discounts available. picnic area, and pavilion for group gatherings. out our website for special events. Other attractions: Farmstand, barns, picnic area. Great for schools & groups. Fall time hayrides, winter time sleigh rides. 10 acre corn maze, plus “Miney’s Maze” a smaller maze for very young children. September), 10 a.m. to 4 p.m. (October). free. Senior citizens (62+) $7. and barnyard golf (some are priced separately, see Web site for details). 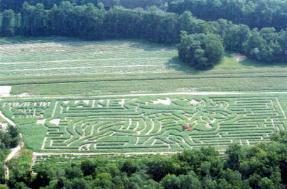 A 2.5 mile maze built in the likeness of farm animals. events & festivals throughout the year. Open: July 29 to October 29th. Days/Hours: 10 - 5 daily Closed Tuesdays Only open if weather permits.